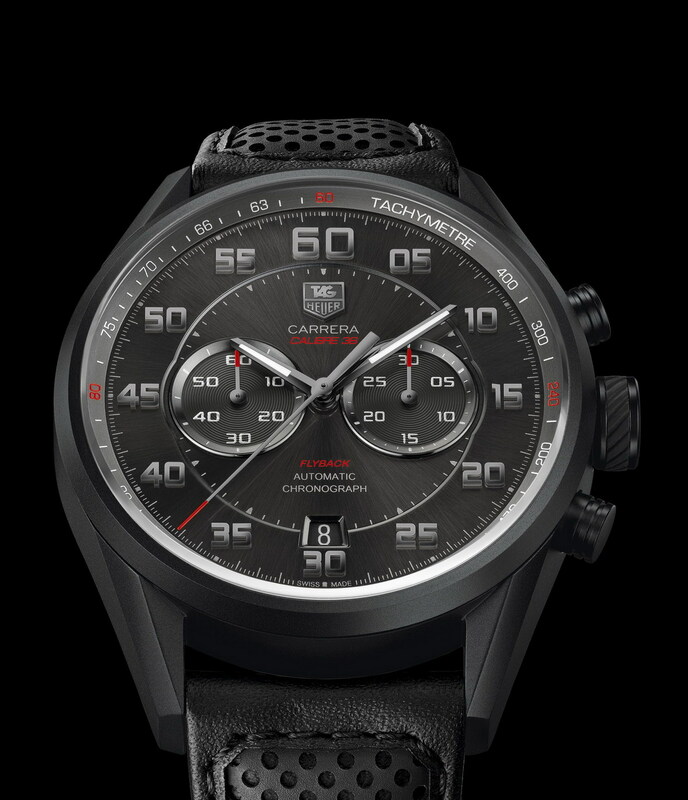 Now that TAG Heuer has released photographs and descriptions of the new Carrera Calibre 36 chronographs, we can provide a quick introduction to these chronographs. Initially, we will post only a few photos of the new chronographs with brief descriptions, and we will soon add some background and more detailed descriptions to this posting. a “racing” model with an anthracite dial and black outer track, in a titanium case (above, right). All three chronographs are powered by TAG Heuer’s Calibre 36 movement, being the brands version of the legendary “El Primero” movement, which was developed and still used by sister brand, Zenith. All three of the new Calibre 36 models feature “stopwatch inspired” dials, meaning that the center area of the dial (in anthracite on both models) is dedicated to the normal “time of day” function, while the outer track of the dial — with the 5-10-15-20 numerals) is used for reading the chronograph second hand. This explains the different lengths of the hands — relatively short hands are used to read “time of day”, while the chronograph second hand is longer, to read seconds on the outer track. The red tip of the chronograph second hand emphasizes this arrangement. This style of using two tracks, with hands of different lengths, is consistent with the approach used by Heuer on many of its handheld stopwatches (as shown on the catalog cover, below). Here, the minute hand indicates “12”, while the second hand shows “48”, on the outer track. TAG Heuer refers to this as a “double scale” dial design, and it is excellent for legibility — whenever you are reading the seconds scale, the end of the hand is never blocked by the minute hand. The Carrera Calibre 36 Flyback chronographs measure 43 millimeters, with a sapphire crystals, front and back. They are water resistant to 100 meters. Each product launch or international watch fair seems to have a “Wow Watch”, and the “Racing” version of the Calibre 36 Flyback seems to win that title for the Carreras introduced at Basel. The movement and functions are identical to those of the stainless steel models, but the case is sandblasted grade 2 titanium, with a coating of black titanium carbide. The Arabic numerals and the hands are “black gold”. A flange between the dial and the crystal is marked with a tachymeter scale, with the 60, 80, 120 and 240 in red. Coming Soon — Heuer’s Heritage in Flyback Watches; the Flyback El Primeros; and more about Flying and Driving!! 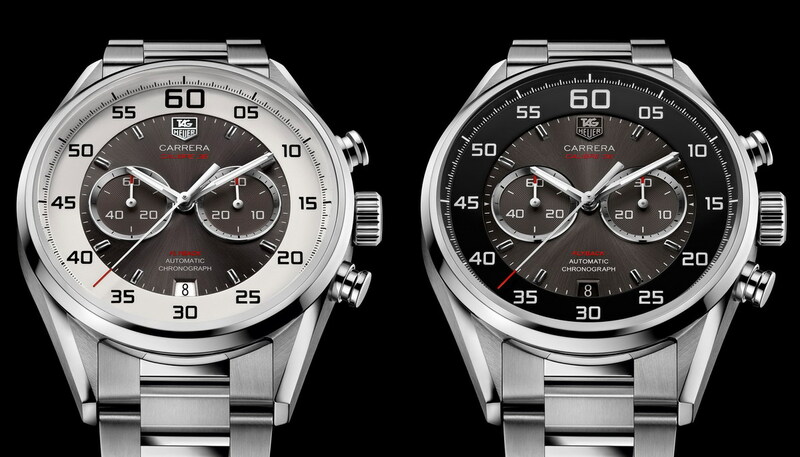 That’s our quick introduction of TAG Heuer’s newest Carreras. Soon, we will update this posting to discuss Heuer’s heritage in the world of pilots watches; how the El Primero became a “flyback”; and how the flyback can be useful for both flying and driving!! For additional coverage of the Carrera Calibre 36 Fylback chronograph, see my posting, Everything Old is New Again — Inspirations for the New Carrera Calibre 36 Flyback, written when the watch was first shown at BaselWorld 2013.